Here’s the last installment on my Italian Engravers tour posts. On Thursday we visited Venice, but as this isn’t engraving related, then I won’t spend too much about on it. The city was nice, glass factory and shops in Murano were just fabulous. I’ve never seen glass art at this level and there I really started to like it. But of course I couldn’t afford 60000 EUR mirror. Visiting Frederique was a blast. I hadn’t heard anything about her before, so I was in for a surprise. After seeing few of her works, she became my favorite engraver of the whole trip. She studied engraving in Belgium and its influence was clearly seen on the design. For my taste this worked very well – kind of symmetrical with very-very nice scenes. Check out the gallery at her own website – Frederique Lepinois. A family owned gun factory. When Zoli had a nice and big CNC park, S.I.A.C.E was basically all handmade. Some parts were outsourced, but most of the things were made there by few workers. Very cool place. 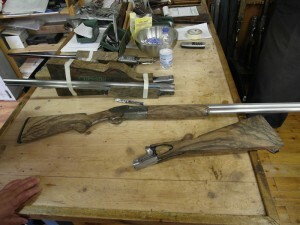 And I got two gun stocks for practicing checkering. What more could I want? Last visit of the trip was stockmaker and his son. 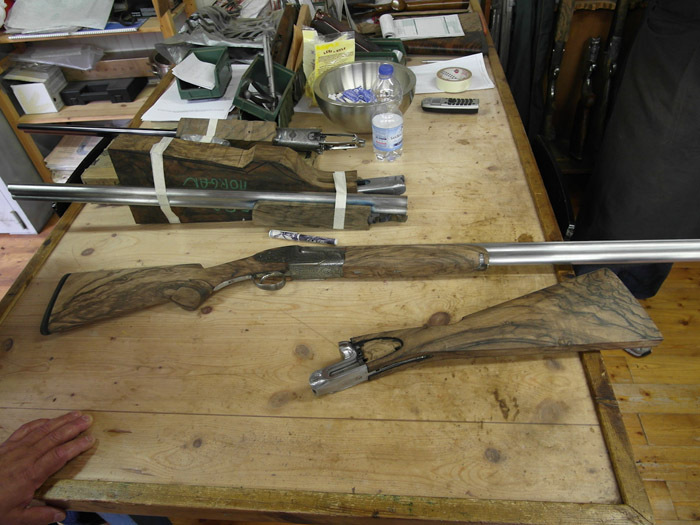 They were making some real nice high-end gun stocks and the ones that I saw there were really-really nice. For the conclusion all I can say, is that this was a really awesome trip. I saw a lot, learned quite a few things and met very passionate, artistic and skilled people. Absolutely worth the while. After that week in Gardone ValTrompia I spend two more days in Rome and then 2 in Florence. Again, very nice and interesting experience.